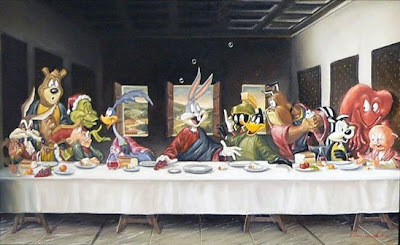 Dallas artist Glen Tarnowski substituted Bugs Bunny for Jesus and other cartoon characters for disciples in his parody of "The Last Supper," which he called "The Gathering." Never has a painting in the Chuck Jones Gallery window attracted so much attention. It has stopped Old Town pedestrians midstep, eliciting smiles and thoughtful looks from some; frowns, angry telephone calls and unfriendly notes demanding its removal from others. The anonymous complaints came in – 10 to 12 a day by phone – and a few notes, unsigned or signed “A concerned citizen.” So the gallery added a biography of Dallas artist Glen Tarnowski, explaining his intent and his background as a devout Christian and an alumnus of California Lutheran University. Craig Kausen, the Irvine-based gallery chain's CEO and grandson of late Warner Bros. cartoonist and artist Chuck Jones, said he even consulted a local priest who, while he hadn't seen the artwork, was not upset by the concept. “There is nothing irreverent about it whatsoever,” Kausen said. Tarnowski defends portraying Wile E. Coyote, Daffy Duck, Elmer Fudd, Porky Pig, Pepe Le Pew, the Road Runner and other characters as disciples, saying God loves people so much that even if we all were cartoon characters, he would have come to us, perhaps in the form of Bugs Bunny. Two customers expressed interest in buying the artwork but, at $20,000, it's not in the average budget, Dicken said. So, for now, it is still in the window, and employees are happy to let Dicken answer the phone.